In an era where the events industry has bloomed noticeably, it’s worth mentioning that The Worx For Events has done great work in the market so far that really needs to be recognized. The Worx is considered one of the leading organizers of events; such as conferences, exhibitions, music festivals, concerts, and even corporate events. Among its achievements are the annually awaited Creative Industry Summit, Amr Diab’s latest concert at Wembley Stadium in London, and content formulation and management for the latest World Youth Forum in Sharm El Sheikh. The great news is that The Worx just signed an exclusive partnership and has become the sole and official representative of the Cannes Lions International Festival of Creativity in Egypt. We got to sit down with Founders Mai Salama and Neamat Khalil, the superwomen behind this honorable achievement, and here’s what they had to say! Give us a closer look at the role of The Worx in the partnership agreement with Cannes Lions? As the Official Cannes Lions Representative, we have three pillars that we work with and they are: Empowering, Educating and Celebrating Creativity. Our Agenda for 2019, will include but not be limited to: hosting local award shows, case nights, nominating jury members for the CL festival, organizing young lions teams, providing workshops, trainings and support to the creative industries, screening of work as well as answering any questions related to the festival and supporting the local market in anything related to CL. How far do you think the creative community in Egypt can benefit from the partnership with Cannes Lions. What we are setting out to do is try and provide more windows for training and learning to the creative industries here in Egypt. We plan to be more of an aid or a tool to further develop the local creative industries. As the leading organizer of conferences, exhibitions, music festivals, and events, do you think Cannes Lions partnership is a different step for The Worx? Actually, it is very relative to our core as a company. We always strive to create impact through our events and experiences, whether it’s for a client a brand or our own initiated event. 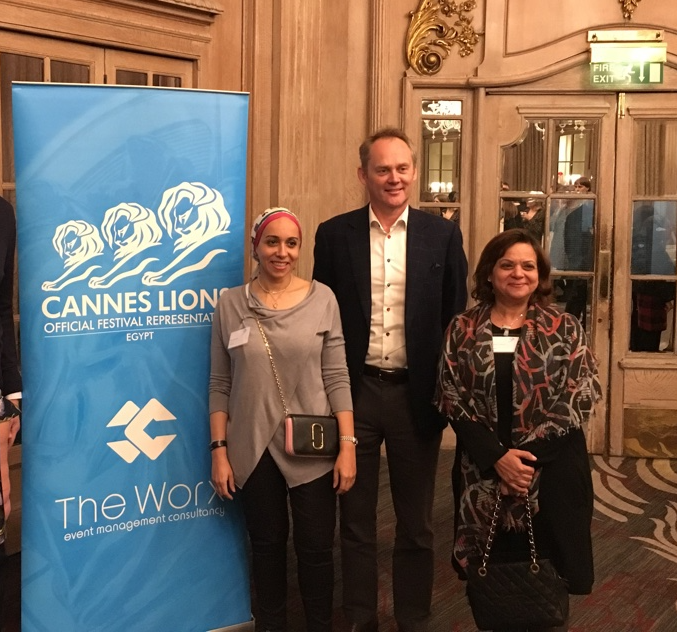 Philip Thomas stated that Cannes Lions has representatives in over 90 countries, what are the creative criteria in Egypt that helped in making this partnership happen? So yeah, as Egyptians we are known for our strong creativity and innovation. Also, the Worx portfolio, the mix of advertising and event management backgrounds for the team, as well as the company achievements were an attraction and made them select us. What were the measurements you took into consideration before and after signing an agreement with Cannes Lions? Umm, well, before it was more about being very precise and straight forward in what we can offer, what we can and cannot deliver as well as the plan for CL in Egypt. Afterward, well, we are now on ground working on bringing this plan to life. Do you think in the year 2020 the Creative Industry Summit will have different approaches and ideas presented due to the agreement with Cannes Lions? Well, in fact during 2019 you will witness a lot of changes and new things from Creative Industry Summit irrespective of the Cannes Lions activities and Agenda. They will both work parallel for the benefit of the creative industries. Tell us more about the turning point where The Worx took off to organizing events as huge as Amr Diab’s concert at Wembley Stadium in London to the World Youth Forum in Sharm El Sheikh? As we mentioned before we like to make events with an impact. In the case of Amr Diab, he hadn’t been to the UK for 20 years so not only was it the first concert in his “Kol Hayate tour” it was also the long awaited concert for AD in the London, we did this with Right Click our Partners and it was a great success, we had fans flying in from all over Europe and the Middle East for this concert, let alone the Londoners who were very excited to have him in town after a very long time. As for the WYF well, it was a great experience, working on the content of such a huge conference and bringing speakers from literally all over the world was a great task, not just for the complexity of it but in fact for one simple reason, we were part of the team that created at least 6,000 ambassadors who are now all over the world, and to this day I tell you I still see their posts about the WYF and about Egypt and what an experience they had, how they networked with the top and leading business shapers and world leaders on a global level and how they enjoyed the beautiful city of Sharm El Sheikh. Name some of the daily challenges you face as female entrepreneurs and how do you tackle them. Forget the founders’ years of experience and background, if we are talking about The Worx, the company has been running for 4 years now and we have managed to work with Uber, Google, PWC, P&G. Event partner with Shaghalni, Develop Creative Industry Summit and bring Cannes Lions to Egypt. I think this says that women rule and we have had no major obstacles, the obstacles we face are everyday normal work challenges. So, yes, maybe we are lucky, maybe we are tough, but we are good on that end. Finally and most importantly, we come from the culture and background that women are doers hence, I think we have proven this in our achievements in such a short period. Tell us more about the points of differences between organizing events (especially music festivals and concerts) in Egypt and abroad, in terms of obstacles, flexibility, permits, and so forth. Abroad there is one regulatory body that you deal with for anything event related. it is more of plug and play and everyone knows their scope and sticks to it. Locally, we are not in fact far off, yet the one entity model is not applied yet. What do you think of the events industry in Egypt? The event industry still has great potential, however at the moment, it is fragmented and not fully regulated. We also feels it lacks education and is based on trial and error rather than methodologies and processes. Having said that, we cannot deny its creativity and the strong companies we have. How can events contribute to boosting tourism and are you planning to organize something of that sort anytime soon? Research shows, that events can create social, economic, and political impact on countries. So to answer your question, yes they can definitely help a great deal on this front, and yes we plan on hopefully leaving a mark in this area. What to expect next from the upcoming Creative Industry Summit? Are you planning for any partnerships to take any of your initiatives to the next level? If yes, tell us more about it. We believe in collaboration and always looking for new opportunities.